One of Korea's top percussion troupes will raise the pulse of music lovers with a specially orchestrated percussion program to be thrown at both the Seoul Art Center(SAC) and National Theater of Korea(NTK) in late January and mid-February, 2004. 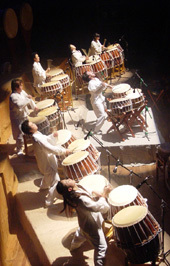 The unique and traditional percussion performances will be held at SAC's Towol Theater at 7:30 p.m. from Jan. 24 through Jan. 27, 2004 under the theme of "Festival for People." The performance to be held at 7:00 p.m. between Feb. 13 and Feb. 15, 2004, at National Theater's Daroreum theater (small hall) are titled "Festival of Heaven." 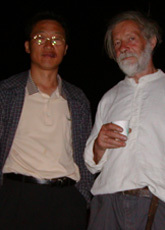 The 90-minute "Tao 2004 Performances" are made up of four parts: Jangseung-je Performance, Percussion Performance, Korean Folk Play Performance, and Tao-ream All Play Performance where both artists and spectators are intermingled. Jangseung is a Korean traditional totem pole set up at the mouth of a village to ward off evil spirits. percussion group. "Dulsori," which literally means "wild beat," is a song sung by farmers working in the field. 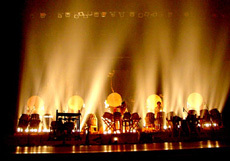 Unlike Korea's best-known percussion musical group "Nanta", another non-verbal percussion musical group run by TV star Song Seung-Whan, Dulsori's Tao is a combination of traditional and modern factors. Tao plays traditional Korean rhythms in modern style. Another difference is the direct and large-scale participation by audience members in the performance itself. "We aim to break the barriers between the players and spectators by staging Tao performances," said Moon Kap-Hyun, director and CEO of Dulsori, "People, particularly urbanites tend to long for the state of nature, and we want quench their thirst for it." In the Seoul Art Center's Jangseung-je Performance villagers (players) set up jangseungs (totem pole guardians) in front of their village on a clear day good for praying for luck. In the National Theater's performance both players and audience go out in the field, and burn a big pile of thatch, each making their wish or two on the biggest Full Moon Day, which normally comes 15th day after Lunar New Year's Day. 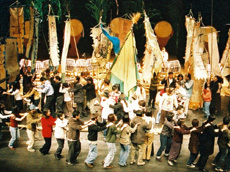 "Tao 2004" performance is meaningful, because this year "Dulsori" celebrates its 20th birthday. As soon as "Dulsori" finishes the two New Year's performances it will go on a five-city tour in Japan: Osaka, Kyoto, Kanazawa, Nagoya, and Tokyo. "Dulsori" is also invited to the New Zealand International Arts Festival in Wellington. The 30-member troupe will also perform at the Singapore Arts Festival in May before it begins 40-day European tour for an open air performance in July. "Dulsori," Korea's representative percussion troupe in traditional style has been staging hundreds of performances including those at an international level since its inception in 1984. Its major global performances include 1993 International Folk Art Festival in Europe. In the year 2003 alone, Dulsori participated in "the Singapore Arts Mart," and the Second Korean Festival held to commemorate the 100 year of Korean immigration to the U.S.
Prices for the Seoul Arts Center's performances range from 20,000, 30,000, to 40,000 won per ticket while performances at the National Theater of Korea are priced at 30,000 and 40,000 won per ticket. For tickets or other details call 02) 741-7676 or 02)413-1631, or visit Dulsori's official website.